A friend at Deloitte has made me aware of his firm’s “Greening the Dot” program, aimed at helping create awareness among Deloitte’s large employee base that being environmentally-friendly is an important thing to do. The leaders of this effort frequently send out newsletters with tips to go green and initiatives that the firm is designing to be a more sustainable enterprise. Not only is this effort a smart play from an employee retention perspective (given the economy, this will be important longer term rather than immediately) but also because it helps Deloitte send a values-laden message to its clients. As a former consultant myself, I know that this industry is often seen from the outside as tough and unfriendly, and focused purely on numbers and deliverables. However, I believe that Deloitte’s “Greening the Dot” program helps send a positive message to the outside world. In the hypercompetitive world of strategy consulting, this can only help. Unplug. Unplug “orphan” chargers and power cords which still consume energy when they are plugged in. Nearly 75% of all electricity used to power electronics is consumed by products that are switched off. Print less. Just because you’re at the client doesn’t mean you can’t reduce the amount you print! Consider having “paperless” meetings. With overhead projectors, we can eliminate the need for paper during meetings. Print duplex. To reduce your paper consumption, “duplexing“ can be done on copiers and printers. Use a reusable cup. Use a reusable cup or mug & save those paper or styrofoam cups from going in the trash. Recycle. 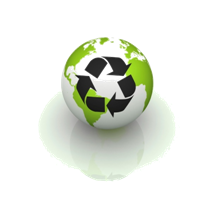 Recycle paper, plastic, aluminum, glass, cardboard, and electronics in your local office. Turn off the lights. Be sure to turn overhead and task lights off as you leave offices and conference rooms. Also, avoid the need for unnecessary lighting by taking advantage of natural light whenever possible. Power down. Update your power management settings on your laptop to “stand by” or “sleep” after periods of inactivity when plugged in. If you only keep your computer on while you are actually using it, and put it on “stand by” for the rest of the time, you can cut energy use by 55%. Dress appropriately. Heating and air conditioning are typically the largest sources of energy use in the office. Dressing in layers can help your body adjust to temperature changes in the office. Keep a spare sweater in the office rather than turning up the thermostat or using a space heater. Travel less. Consider videoconferencing and other technology options to reduce your travel. This actionable series of tips, although just a start, provides a simple roadmap to Deloitte consultants of ways to easily go green when on the road at a client site. None of these tips are difficult to implement, but all are sensible and can have an impact.